Each wheel of Parmigiano-Reggiano that is approved by the Consorzio receives the official brand. Parmigiano wheels are enormous, weighing 80 pounds. All photography provided by the Consorzio del Formaggio Parmigiano-Reggiano. CAPSULE REPORT: “Parmesan” cheeses are made in a variety of countries. But authentic Parmigiano Reggiano cheese is produced only in the Italian provinces of Parma, Reggio Emilia, Modena, Mantua and Bologna. Only the milk from local cows, whose diet is regulated according to a strict feeding discipline, can be used in the production of the cheese. The cheese is checked by an expert after 12 months; if it passes the test its rind is stamped and it continues aging for an average of 24 month, to develop prime flavors and aromas. 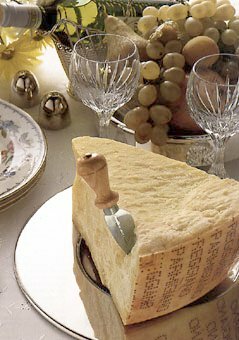 In Italy, Parmigiano-Reggiano is more than a grating cheese for pasta: It is part of a fine antipasto and also enjoyed for dessert, with some balsamic vinegar and a glass of fine wine. This is Page 1 of a 2-page article. Click the black links below to view other pages. If you think this month’s column is going to be about something called “Parmesan” that you can buy pre-shredded or vacuum-packaged, we’ll have to send you back to Cheese School. This edition is about Parmigiano-Reggiano, the real deal (accept no substitute!). What’s the difference? It turns out that anyone can make a cheese called “Parmesan,” which is why large-scale food companies can market green cardboard tubes of salted, granulated sawdust under that name. True Parmigiano-Reggiano, however, must be produced in a distinct region of Italy, by a cheesemaker who is a member of the Consorzio Formaggio Parmigiano-Reggiano, a self-governing body of dairies. The cheese is produced in accordance with strict regulations, and a fine-quality Parmigiano-Reggiano is one of the glories of the cheese world. But more on that later. A little creative time-travel is called for first. Let’s go back to the medieval era, figuratively speaking (I’d hate to have to do that literally). In the 13th century, in northern Italy, in the provinces of Parma, Reggio Emilia, Modena, and Bologna, a long-aged cheese began to be produced in some of the bigger Benedictine monasteries. These monasteries were associated with large areas of land, much of it given over to dairy cow grazing. Cow’s milk is heavily influenced by the diet of the animal, and it’s known that the monks cultivated clover and lucerne, which gave a particular flavor to the milk that came through in the cheese. This was Parmigiano-Reggiano, and there are many who claim that neither the cheese nor its production methods have changed substantially since the 1200s. 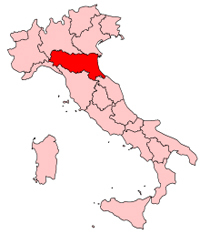 Map: Italy, highlighting the modern province of Emilia Romagna. Today, Parmigiano Reggiano is a D.O.P. protected cheese that can only be produced in the areas of Parma and Reggio Emilia in Emilia Romagna. Map courtesy of Wikipedia. How is Parmigiano-Reggiano produced? It begins with the cow feed. According to the Consorzio’s regulations, cows producing milk destined to become Parmigiano-Reggiano can be fed only grasses and hay. 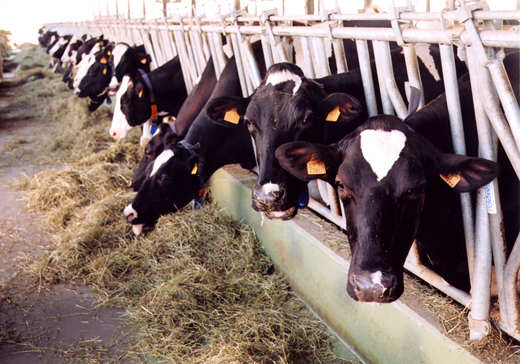 Any fermented fodder, or silage, such as is commonly fed to cattle here, is off-limits. The cattle also cannot be fed any food of animal origin or any food by-product (that happens all the time in the U.S.). Because Parmigiano-Reggiano is always a raw milk cheese, milk quality is of great importance and is checked frequently. There are roughly 600 dairies allowed to produced “Parmigiano” (as it will henceforth be called for the sake of brevity), and about 7,000 farms sell milk to these dairies, the milk coming from some 200,000 cows daily. The bulk of these cattle are Friesians, famed for their high milk yield. The cows are milked twice daily. Milk from the evening milking is allowed to stand overnight. By natural processes, this milk will have partially separated during its overnight standing period. The cream is skimmed off, and the partially skimmed milk is combined with whole milk from the morning milking. The milk is then heated in vast copper cauldrons (some hold up to 1,200 kilograms, or over 2,600 pounds, of milk). The cauldrons must be copper. Officially, the Consorzio holds that copper is used for its superior thermal conductivity and gives no taste to the cheese. But cheesemakers in other countries, such as Switzerland, insist that copper imparts elements of flavor to the finished product. So concerned is the Consorzio with keeping the good name of Parmigiano that it even regulates how many of these heating kettles each certified cheesemaker can oversee (a maximum of seven). These certified cheesemakers have all undergone between ten and fourteen years of apprenticeship, so obviously the making of this cheese is not something lightly regarded in Italy! The milk is heated in large copper cauldrons. 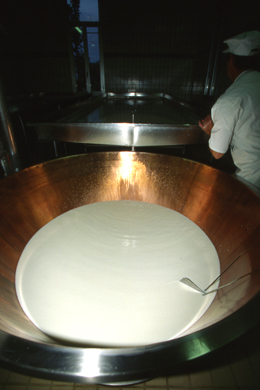 The milk is gradually heated to 30 to 35°C (86 to 95°F) before starter culture and then rennet are added. The starter culture must be made in each dairy from the previous day’s whey, which is allowed to ferment overnight. And only rennet from calves is allowed as a coagulant, none of the more modern vegetable or microbial rennet. 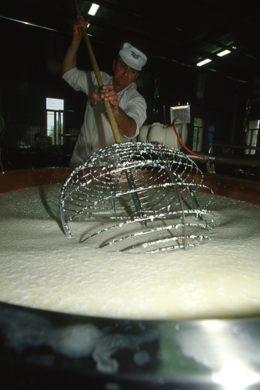 The curd forms and is broken down into smaller particles traditionally by stirring with an enormous balloon whisk called a spinatura or spino (see photo below) The mixture is heated to allow further separation of the whey and development of the correct acidity level. When the latter is reached, stirring stops, and the curd settles into one mass at the bottom of the cauldron. The curd is hauled up from the cauldron bottom in large squares of cheesecloth and allowed to drain. It’s then divided into halves, and each half is placed into a straight-sided, cheesecloth-lined mold, called a fascera. After more draining, the cheesecloth is removed, and plastic sheets bearing the words “Parmigiano-Reggiano” in a repeating pin-dot pattern, as well as the identifying number of the producing dairy and the month and year of production, are placed between the sides of the forms and the cheese (which is still soft enough to take on such impressions). A disc made of casein is applied to the top of the cheese; this disc contains a unique code which is used to identify every wheel of Parmigiano individually. Only now is salt added, and this is accomplished by immersing the cheese in a brine solution for up to four weeks. Gradually, the salt in the brine will work its way into the center of the cheese, but that requires months of aging. This huge whisk, called a spino, breaks down the curd. The minimum aging period for Parmigiano is twelve months. At the end of that time, each wheel is inspected. Inspectors tap the exterior of the wheels, listening for certain sounds. If a wheel sounds hollow, for instance, that indicates physical flaws in the cheese. Sometimes, a thin probe will be inserted to draw out a small interior “core.” The cheese inspectors are well-versed in their art, and they can detect with ease flaws that would elude the average person. If flaws are found, the pin-dot pattern on the sides is scraped off. The cheese can be sold as cheese for grating, but not as Parmigiano-Reggiano. If a cheese passes inspection, the Consorzio certifies it with a brand on the side of the cheese wheel (see photo at the top of the page). As is typical of so many cheeses, production of Parmigiano can be a tricky business. Even slight alterations in cooking time, acidity level, or any of a hundred other decisions can result in a sub-par end product. When you consider that it takes over 150 gallons of milk to make just one wheel of Parmesan and add in the necessary care and expensive aging time required, you begin to understand why true Parmigiano costs more than any Parmesan. (Parmesans are manufactured in the U.S. and elsewhere.) Some Parmigiano is purposely eaten young (that is, soon after its twelve-month certification), but most is aged for at least eighteen months. However, flavor is always more important than aging, and good handling is crucial to good flavor. An authentic Parmigiano-Reggiano has the stamp of the Consorzio Parmigiano-Reggiano in its rind.